I just heard about the PyCon Ireland conference that is on next weekend in the Radisson Blu, Golden Lane, Dublin. Looks like a great line-up of speakers on all things Python. I’m particularly interested in the “Introduction to MongoDB and PyMongo” by Brendan McAdams of 10gen. In case you hadn’t heard, 10gen is also opening an office in Dublin next month. Time to make Dublin the NoSQL capital of Europe? This really is top news from Dublin Web Summit and Enterprise Ireland. 25 start-ups will be able to exhibit at the #DWS Startup Zone for only â‚¬550 each! That’s down from â‚¬4,470 list. What are you waiting for? Do it. The first Coder Dojo is opening on theÂ Saturday 23rd of July at the National Software Centre, Mahon, Cork. Registration is fromÂ 11am to 12pm and the session will run from 1pm to 5pm. They will be looking at the basics of coding in HTML and CSS and then having an open coding session. It’s open to all ages and all levels of experience, justÂ register here online . Head on over to their blog for more info. Note that they are also looking for volunteers and spaces in Galway and Limerick as well. And do something useful for the community/country. NDRC’s Inventorium is running Irelandâ€™s First Open Data 18 Hour Challenge. I absolutely love seeing this happen. Looking forward to seeing some great apps. Dublin Web Summit Start-up Competition – â‚¬40k – Nice. Who doesn’t remember last year’s Spark of Genius Competition won by Data Hug which resulted in major publicity for the guys. We’re all looking forward to it coming out of private beta. 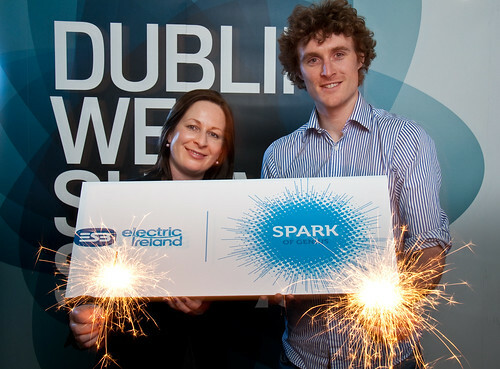 Well DWS is at it again, this time with ESB Electric Ireland, and they have a â‚¬40k prize fund of cash and services. 2011 judges include Brian Caulfield of DFJ, Shay Garvey of Delta and Mark Roden of Ezetop. Shortlisted companies will pitch at the Dublin Web Summit on October 27th. Applications will open from June 10th and we’ll let you know here when they do. The Startup 2.0 Competition has been around for a few years now and has always bubbled up some interesting companies that are not on the usual tech blog circuit. This year is all about Mobile and they are looking for the best Mobile Startups and Apps across Europe. On June, 17th the 5 best startups will present their projects at the Nonick Conference in Bilbao and people will vote to select the winner. Disclosure: I’m one of the jury members. There is so much happening in mobile in Ireland right now, it would be fantastic for those apps to get a wider audience. Here are two of the Decks that were presented at the recent Facebook Garage in Gateway Ireland. Excuse the blatant pimping but I thought it was worth mentioning the IIA Event that is on this Thursday afternoon in the Burlington in Dublin. It’s called “8 More Ways to Sell Even More Stuff” and the focus is on Content, Analysis and Store Format. Yours truly is one of the speakers with my LouderVoice hat on and I’ll be digging into how Customer Reviews are the lynchpin of Social Commerce. To be absolutely brutal about it, Ireland is years behind the US and UK in the adoption of newer approaches around e-commerce. I hope the material at this event will make a lot of people wake up to the possibilities. If you are already selling online or you are thinking about it, then you will hear about what is important now and in the next two years.Â At â‚¬99.99 (â‚¬79.99 for IIA Members), it’s a steal. The Dublin Web Summit events just go from strength to strength. The next one is coming soon on March 8th in Trinity College. In addition to the main event there is also a Startup Bootcamp during the day and networking drinks afterwards. Don’t forget there is a Pub Summit this Thursday night in The Odeon. Sign-up is on Eventbrite. The Facebook Garage on Wednesday was an absolute thrill to be a part of. We had 140 sign-ups so, using our normal measures around free events, we expected 50-60. In fact it peaked at over 90 people! Luckily the lovely Gateway Ireland building was easily able to accommodate everyone. This was followed by Ben Arent and Jonathan Siegel providing insights into the the challenges around different sign-up flows and abandonment on RightRental. Then we had David Johnston from OWJO talking about f-Commerce and in-Tab stores. Sebastien Sicot from Bluecube Interactive gave some genuinely surprising stats on competitions, engagement and incentives. As I said at the end of the event, we want as wide a range of people speaking at the Garages as possible. Whether you are a lone developer or a large company doing interesting, useful or fun things on the Facebook Platform, we want to hear you speak. Why not contact web2ireland.editor@gmail.com now if you think you’d like to speak at the next Garage. The plan in 2011 was to do one Garage per Quarter but the feedback on Wednesday was that you want them more often. So we’ll aim to have the next one much sooner. Keep an eye on Web2Ireland.